'L'Italia romana. Storie di un'identità incompiuta', Laterza, Roma-Bari 1997 (terza ed. 2004) ISBN 8842052361. 'L'uomo romano' (Roman Man) is in its nineth Italian edition and was translated into English (ISBN 0226290506), French (ISBN 2020123363), Spanish, Portugese (ISBN 9722314807), German (ISBN 3596126037), Polish and other languages. 'Roma antica', second ed. Laterza, Roma-Bari 2003 (1st ed. ISBN 884206131X). 1.1 How could a slave in Rome obtain his freedom? 1.2 The sources attest, above all during the reign and the Republican age, a sacral approach of the Roman towards the main events, from most complex inherent to the life of the state, to the simplest legacies and to the daily events. I ask if, in the cited ages, it is recognizable a sacral sphere in the Roman approach to the slavery or if everything can be brought to a pure utilitaristic sphere? 1.3 In which measure the slavery has been important for the "good roman economy"? Can it be considered the "turbo" of the economic system of that times? 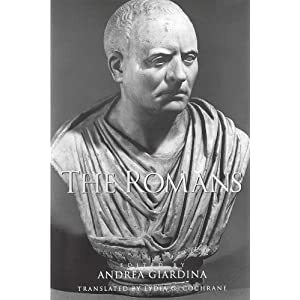 1.4 To be enslaved in Rome at the times of Scipioni, of emperor Tiberius, and of the Severi: how did it change their condition and their social status? 1.5 Which were the tasks of Roman slaves? How could a slave in Rome obtain his freedom? With the term manumissio, the Romans indicated the action through which the lord granted the freedom to his slave (the lord renounced, through that action, to the authority, called in latin manus, that had on the slave). In Rome, the liberation of a slave involved a quite simple procedure: the decision of the lord was practically unobjectionable and demanded a banal formal approval from a magistrate. But the lord could free the slave also for testament. The freed slave, or libertus, was a "nearly citizen": could vote in the assemblies, but not be elected; his sons, instead, became roman citizens with plenty of powers and rights: integration of the former slaves in the roman society was much faster than in other societies. The Romans boasted themselves of being the only community that easily integrated therefore the slaves and this characteristic was an important aspect of their "autorepresentation". The only among the ancient cultures, the Roman one quite valued the slavery element of their own origins: they said, as an example, that the mother of the great king Servius Tullius was a slave; they used to say that Romulus received in a sacred fencing called "asylum" individuals of every origin, just to give body to the new city: from this nucleus would have had origins the first peopling of the city. Roman slavery had therefore two faces: one is that, terrible, of the exploitation, the punishments, the crucifixions (who does not remember the film “Spartacus” of S. Kubrick?). The other is that of the relatively easy liberation and integration. This characteristic of the roman society struck a lot also the strangers. At the times of the second Punic war the Macedonian king Philips V, allied to Hannibal, wrote a letter to the inhabitants of a Greek city in order to urge them to grant more easily the citizenship to the strangers: "Do like Romans, he wrote, that when they free the slaves they put them in the citizenship. In this way they have increased their native land and become much more powerful". The king of Macedonians picked a fundamental point. The freed slaves, in fact, became suddenly soldiers to serve in the roman armies. Rome widely adopted the practical chance of the manumissio and therefore had more numerous armies. In the complex existing psychological tie between slave and lord the perspective of the liberation carried out a precious function: it rendered the slaves desirous to acquire merits in front of the lord and pushed them to assume docile and submitted behaviours. But this happened nearly exclusively for the domestic slaves or however for who of them that had more contacts with the lord. For the others - and it was a matter of the great majority - the slavery was a condition for the life. The roman conceptions of slavery did not differ a lot from the Greek ones: also in Rome the slave was considered a property of his lord, and could be beaten or killed to his will. In Italy the slaves were a multitude: we don’t have any precise information, but it is probable that they represented a third to the half part of the entire population. Therefore this great number of slaves, often held in conditions of extreme suffering, determined a constantly explosive situation. Particularly serious were the revolts exploded in Sicily between the 139 and the 132 b.C. and the revolt of Spartacus, that caused great bloodshed in Italy between the 73 and 71 b.C. The sources attest, above all during the reign and the Republican age, a sacral approach of the Roman towards the main events, from most complex inherent to the life of the state, to the simplest legacies and to the daily events. I ask if, in the cited ages, it is recognizable a sacral sphere in the Roman approach to the slavery or if everything can be brought to a pure utilitaristic sphere? A “sacral approach” to the slavery did not exist. However, some aspects of the relationship between dominus and slave had some religious connotations. We have seen how the slave was an object in the hands of the lord. But a cruel lord, that used to beat, torture or sentence to death his slave without any reason or with vain reasons, was considered by the members of his own class a censurable man. In other words, was strong the conviction that also with the enslaved had to be used a behaviour respectful of the pietas. This concept, that would be reductive to translate with "mercy", was steeped both in moral and religion. The pius man was appreciated not only by the other men (free or enslaved who were) but also by the Gods. The stoicism (we can all remember the words of Seneca) showed a certain comprehension for the condition of slaves (ET homines sunt..., “they are men, anyhow") but it never arrived to sentence the moral necessity to abolish the slavery. The same conclusion was arrived by the Christianity, that exhorted the lords to deal in the mild way their slaves, but exhorted at the same time these ones to accept their own condition. It was diffused the conviction that the slavery corresponded to a right jus, just a nature jus. In which measure the slavery has been important for the "good roman economy"? Can it be considered the "turbo" of the economic system of that times? All the most flourishing economies of the antiquity were based in greater or smaller measure on the job of the slaves. But no ancient society carried the exploitation of the slaves to the level of efficiency caught up from the Roman. It is above all demonstrated by the new organization of the slavery diffused from the II century b.C. (at the times of the great Mediterranean conquests) in the farms of average and big dimensions of the central and southern part of Italy, the so-called villae. These productive units were mainly present in Etruria, Latium and Campania, in places not far from the harbours or however easily reachable through fluvial roads or ways. Strongly oriented towards the Mediterranean markets, these villae produced oil and wine above all; their labour was mostly constituted by enlisted slaves, subordinates to a hard constriction, finalized to efficiency and productivity. This specialization of the job and this coordination generated a remarkable standardization of the products. We assist therefore to the birth of a new type of slavery: previously, as in Greece as in Rome, rural slaves were employed in a large way as labourers. Now they are arranged as a structure finalized to the maximum productivity: the slaves, enchained and subordinated to a continuous control, used to work with precise rhythms under a strong direction. All their existence was finalized to the job: at the sunset they did not came back again in a family or dwellings of domestic type, but in a prison, the "convict-prison", from where they were captured again at dawn for a new day of hard work. The increase of the system of the villa, attested from literary sources, rural archaeology and the study of the ceramic containers (above all oil and wine amphoras) took place in a massive way between the II and the I century b.C. : this period can be considered like the phase of the greatest increase of the roman economy. This vicissitude shows how a certain type of slavery could determine an intense economic increase. To be enslaved in Rome at the times of Scipioni, of emperor Tiberius, and of the Severi: how did it change their condition and their social status? The main regarding transformation of the slavery job in ancient Rome happened at the age between the last centuries of the republic and first of the empire, as for the passage from the system of the slavery villa (see above) to another system, where the slaves were used in various ways. In the system of the villa, the supply of slavery labor was guaranteed above all from the capture of prisoners of war, men, women and children. We have to consider that the conquest of Gallia from Iulius Caesar determined the deportation of approximately one million of individuals that were sold like slaves. These prisoners of war became prize of the soldiers or were sold by auction from the public authorities. In the Italy of this period, and also in provinces like Sicily, there were individuals that possessed thousands of slaves; but every free citizen who was not in condition of absolute poverty possessed at least one slave. Another source of supplying was the free market economy. It seems that in the main place of slaves sale, the Greek island of Delos, were put in sale up to 10.000 slaves a day. In the first imperial age, the age of the great conquests can be told virtually ended: the slavery labor, consequently, does not come anymore from booties of war, but mainly from other sources. The most important of these sources was the breeding of the slaves. They reproduced themselves in the property of the lord. The slaves born in this way were assigned to renew the force job of the lord, once reached the correct age, or were put in sale. The slaves with their own family did not work anymore according to the previous regimen of the convict-prison, typical of the system of the villa, but had their own dwelling, apparently similar to the small peasants’ one. They used to live undoubtedly in better conditions, above all from the moral point of view. But the italic economy lost the dynamism of the previous period. Which were the tasks of Roman slaves? The destiny of the men reduced to slavery was quite various. There used to be precious slaves, whose value was worth how an entire farm: they were usually learned men, captured during the campaigns in the East, that were able to teach Greek letters to the sons of the rich Romans, or were valuable artists. They were dealed with great cure and were integrated easily in the family of their lords. A privileged position was held by those slaves that could carry out a privileged job: craftsmen, agronomists, doctors, veterinaries, etc. Among the slaves of the great city dwellings could be found a specialized staff, for example cooks or men assigned to administrative functions (secretaries, scribae, accountants, cashiers) that took care of the finances of their lord. Also not being free, individuals as these had a better social status than that of many free ones of poor condition. Their social importance, in fact, was directly proportional to that of their lord. But the houses of the rich ones also were crowded by a remarkable number of simple slaves, assigned to the humbler services. In the cities, the slaves were widely used also for the handicraft activities and trade. We have already said about the slaves employs in the rural villae (see above). But the slaves were also widely used in the sheep-rearing. The animal breeding was carried out in the open spaces: flocks and herds could often move of about tens or hundreds of miles, depending from the season, at the search of pastures and a favorable climate. These animals often were entrusted to slaves: they were a matter of dangerous individuals, because they could move with little control and were armed in order to defend the animals from the bandits and the predators, of which our peninsula was rich (wolves, bears, etc). The lowest step of the slavery condition was represented by the individuals that were sent to the forced jobs in the mines. Subordinated to the hardest engagement, with debilitating rhythms, in unhealthy and dangerous conditions (the downfalls in the ancient mines were most frequent), in the mines the slaves were consumed like the fuel in a boiler: in these places was represented the most macabre and inhuman show of the ancient world. This page was last modified on 23 February 2007, at 21:33.